I've never done a PTS before, so I have no idea how the process works. My sales guy told me recently that there is a certain window during which PTS is done, but he could elaborate on when this window is. Does anyone know whether there is a certain process/policy that dictates when the PTS build window starts and ends? BTW, my order will be a RS. Thanks. For regular models, the PTS window usually opens at the start of the model year ordering process (e.g. May/June 2014 for MY2015 991's). It often closes in the Fall (e.g. December 2013 for MY2014 cars) and the PTS orders are build in batches the following Spring! That is not set in stone. 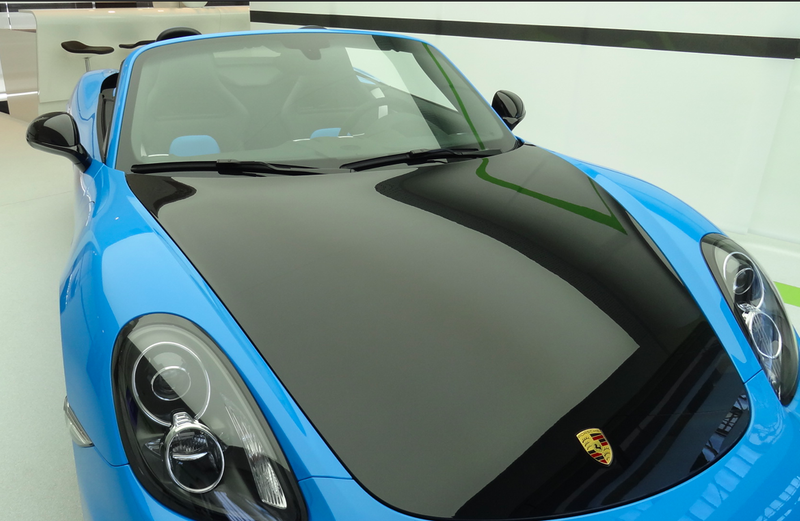 For the MY2012 Boxster Spyder, the 'PTS Window' opened up for two weeks in March of 2011 and the cars (only 3 for US market) were built all in July of 2011. So go figure. For gt3 & gt3 RS's, it varies and there might not be any set rules for PTS. For example, I don't think that PAG allowed PTS for MY2007 in the .1 997 gt3's, period! The first PTS .1 997 gt3's that I remember were all MY2008's. For the MY2007 & MY2008 .1 997 gt3 RS's, only one other color was allowed besides 'RS Orange', 'RS Green', 'Silver' & 'Black'. And that color was 'White'. 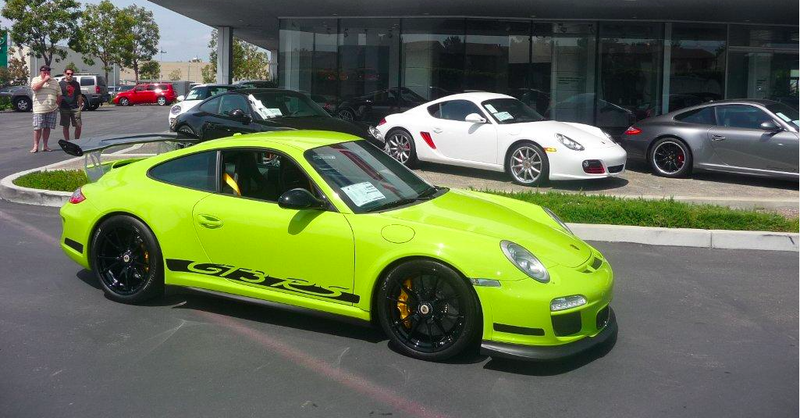 PAG truly didn't allow PTS (in the real sense) in the 997 gt3 RS's until the .2 versions in MY2010/MY2011. A few PTS were allowed in MY2010...but the bulk of the PTS gt3 RS's were built in MY2011! 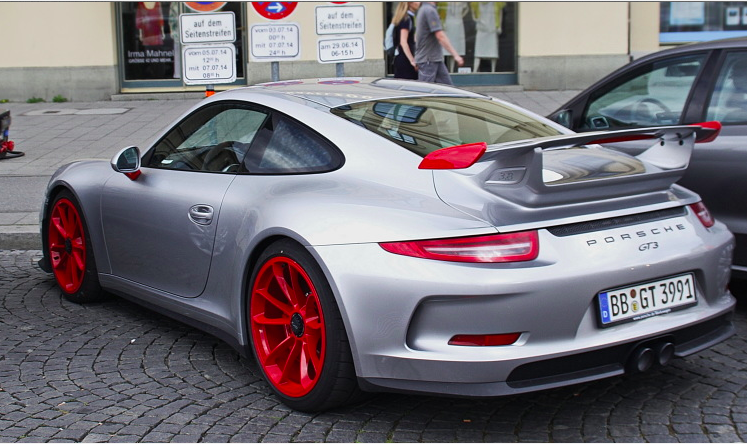 For the folks that ordered a 991 gt3 early and were scheduled for production in the fall of 2013, they were told 'no' on PTS! For those expecting to get their MY2014 991 gt3's in the spring or later, PTS was apparently available. But the deadline for PTS was December of 2013, when the 'window' closed! The 'stop sale' messed up those orders. Someone in this forum has claimed there is at least one 991 gt3 for the US market that was done in PTS and was finished just before the 'Stop Sale'. It is supposedly now at port here in US awaiting its new engine. 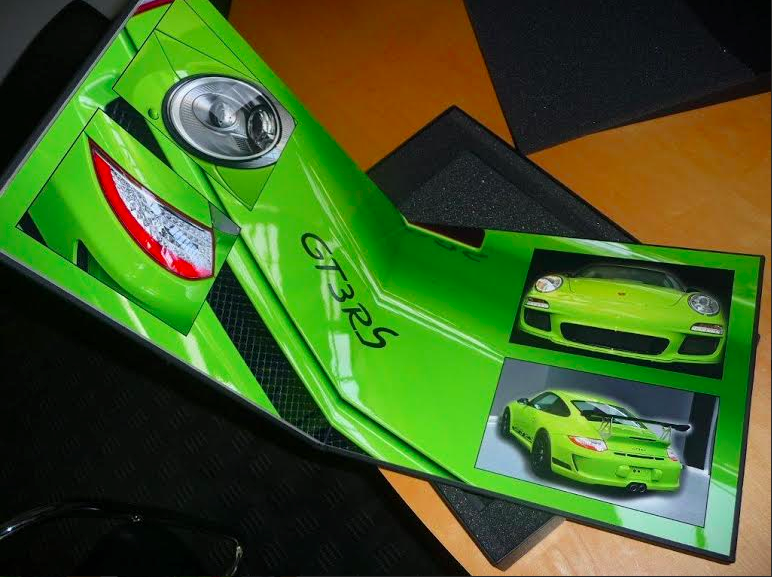 But we have yet to see photos of a real PTS MY2014 gt3.... The Indonesian 'blue' car is believed to be a 'vinyl wrap'. 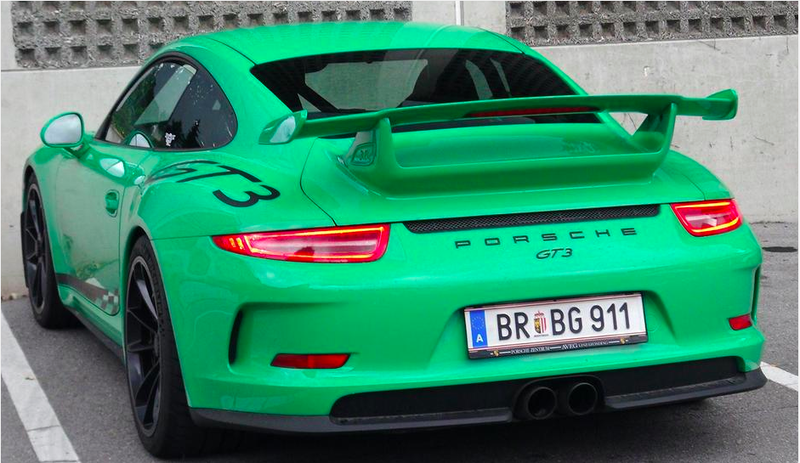 (new info: We have now seen PTS gt3's in Europe, believed to be late MY2014's that were done Paint-to-Sample but caught up in the 'stop sale' - see attached photos of a 'Birch Green/Lichtgrün' gt3 and what appears as a 'Viper Green' gt3 in Austria!). What PAG might decide to do re: PTS on the yet-to-be introduced MY2015 gt3 RS is anybody's guess. 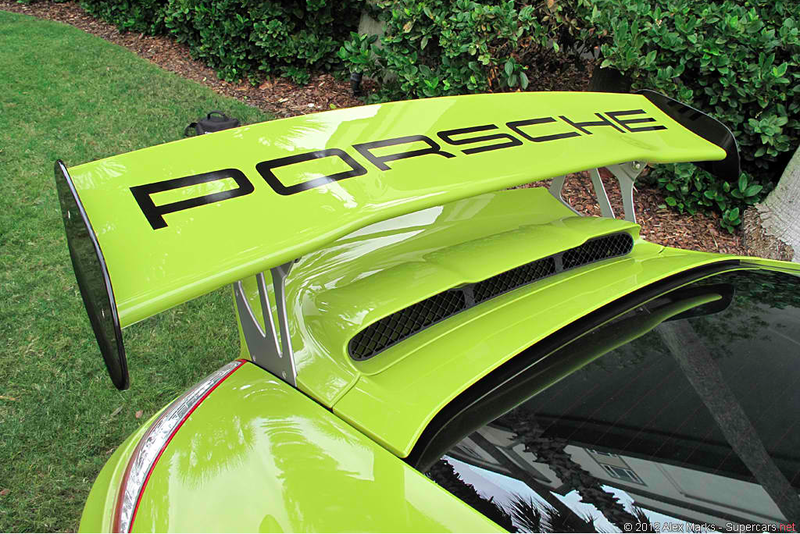 My hunch is that PAG will limit color selection to 4/5 choices, much as they did for the MY2007/2008 gt3 RS's. 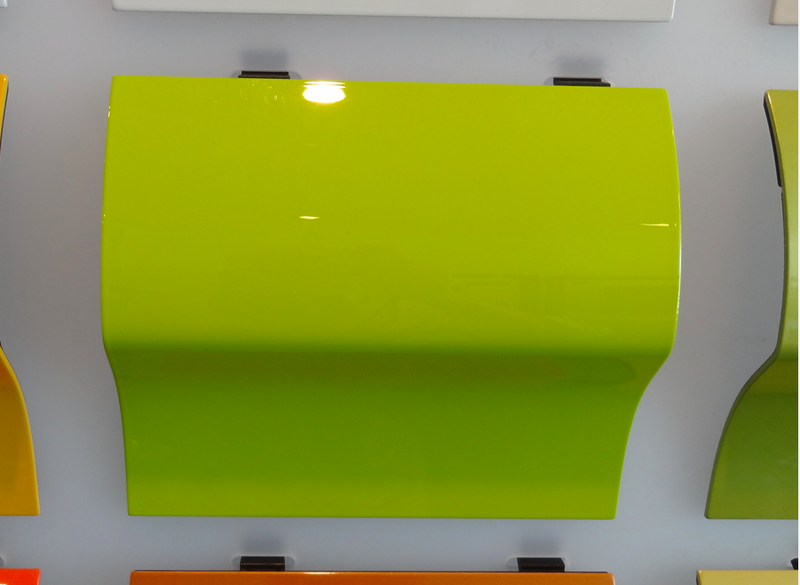 They are probably going to offer at least two really 'loud' exterior colors in the 'RS' tradition! And there is a pretty good chance, based on recent history with that model, that PTS will NOT be initially offered on the 991 gt3 RS...but only to be available in the .2 version in a few years down the road. 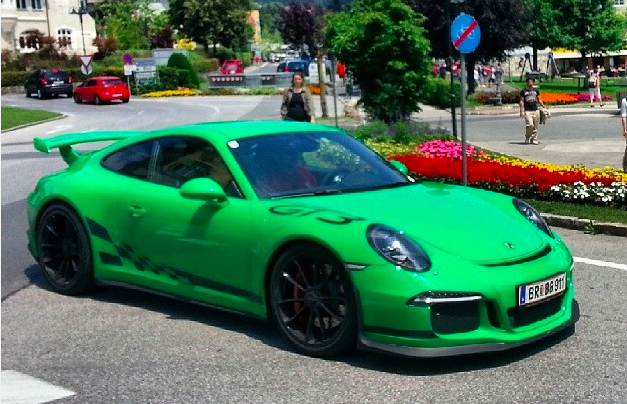 Assuming there is a .2 version of the 991 gt3 RS! Last edited by Z356; 07-14-2014 at 02:07 AM. Reason: Add More Photos! Re: 'Mahogany Metallic' - More expensive color on gt3! Of the two colors shown by Macca, the 'Mahogany Metallic' is the most striking! As most of you know, 'Amaranth Red Metallic' has been dropped as an offering in MY2015 and its not yet approved for PTS. So no sense in trying for that one on your rare PTS allocation for MY'15. The one interesting thing I found out just now checking on the US configurator is that 'Anthracite Brown Metallic' is a $3140 'Special Color' for the gt3 and it's only $710 on the regular 991 models. Go figure! Re: Painted Brake Calipers in 'deviated' colors??? Can you order the calipers painted a different color from Porsche? "The official line is that PAG wants certain colors associated permanently with a particular variation of their brakes so that they are instantly recognizable by 'all' worldwide. So 'Speed Yellow' for the PCCB's, 'Guards Red' for the 'S', 'Black' for the non-S (base), 'Acid Green' for the Hybrids, and 'Silver' for....don't ask, because even they don't know why they are painting some calipers 'Silver' (e.g. some Panameras & Macans). For their super VIP 918 clients, they have allowed them to option their calipers in 'Silver' if a customer doesn't want them in the standard 'Acid Green'. That is a costly option at nearly $3K! But for anyone else ordering a less expensive model from factory, I don't think they are giving you even that choice! In Zuffenhausen last year, the 'Porsche Exclusive' representatives spent time explaining to me why PAG normally refuses the many requests they get each year from customers asking for their brake calipers in a deviated color. The answer the give, they said, is always 'Nein'. Interestingly, some other auto marques that allow optional deviating colors on their brakes caliper have recently had a surge in requests for 'Speed Yellow'. This apparently in order to broadcast to the world that they paid extra for carbon fiber rotors and have everybody easily recognize them! So Porsche's color branding strategy is apparently subconsciously 'working' on the greater auto enthusiast world even beyond their own models!" On to another VERY important point.. do you happen to know which colour is this one.. I have heard it referred to as Audi RS blue.. but cannot find more details anywhere about it. I wanted to get in touch with the owner as he used to be on pistonheads.. but he's apparently in a place where communication with the outside world are not allowed and orange is a fashionable colour to wear your uniform in. 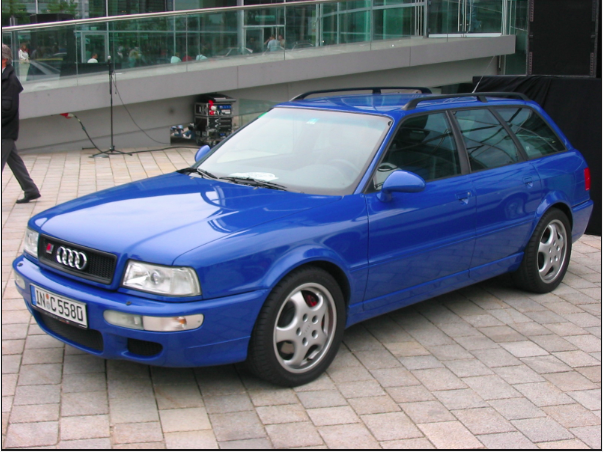 Well, 'RS Blue' (which later became Audi's popular 'Nogaro Blue') was the signature color of the 'old' Audi RS2 Avant (photo #1). 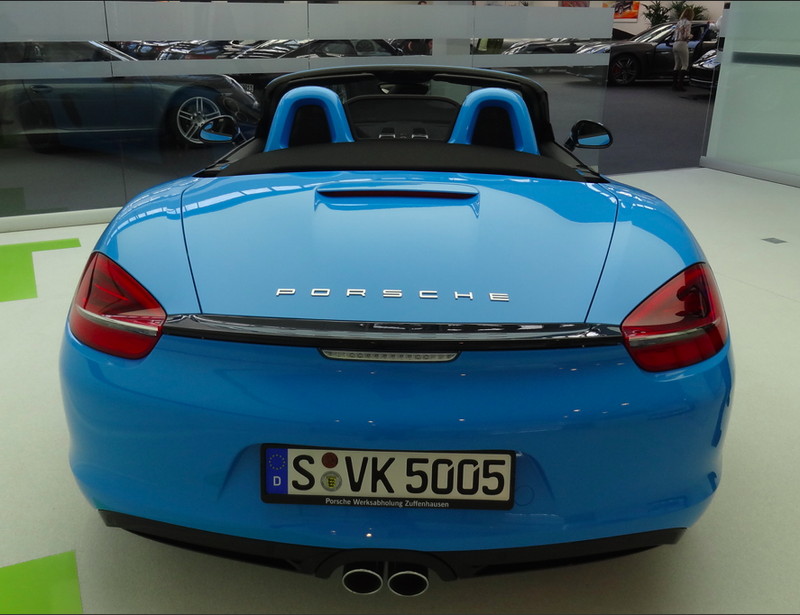 It was claimed that it was inspired, or copied directly, from a Porsche blau color (like in photo #2? 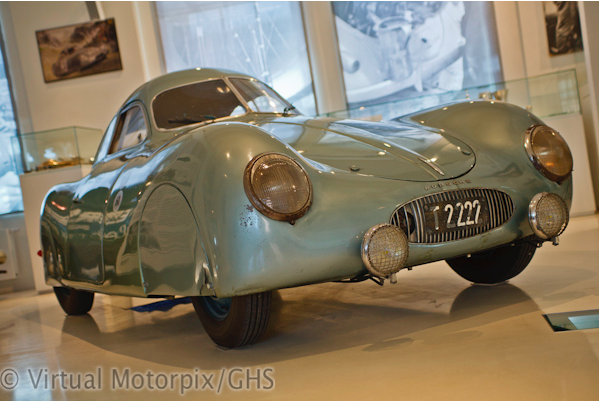 ), which was not that surprising since the car was actually assembled at Porsche in Zuffenhausen's Rossle-Bau building! 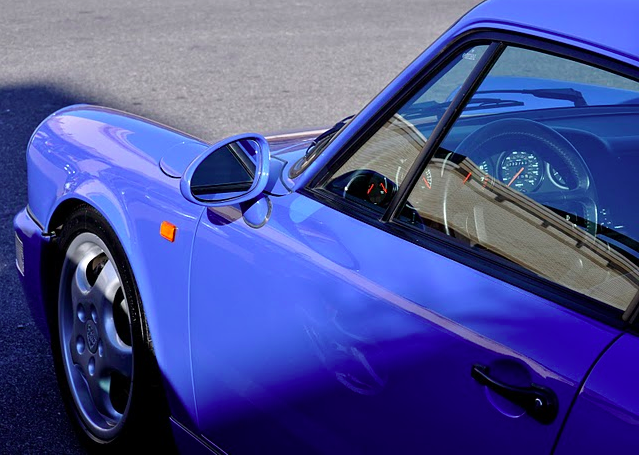 At the time, I thought the Porsche color in question was 'Maritime Blue' (last photo, #3). But now I am not so sure. 'Maritime', in my opinion, is a much nicer color than Audi's 'Nogaro' and it's not a Metallic. It has some 'purple' tones. Maybe others can chime in on this subject. By the way, 'Maritime Blue' is currently approved as a PTS hue with color code # 38B! PS I think the email still works in the Eastern part of the Ukraine and the 'new' Russian territory of Crimea. Does the PTS color or paint code appear on the Monroney Window Sticker of a Porsche? Wouldn't the paint code be on the window sticker? No, it doesn't show on the Monroney window sticker on a Porsche. In the 997/987, it did showed up on the inside of the external gas lid. 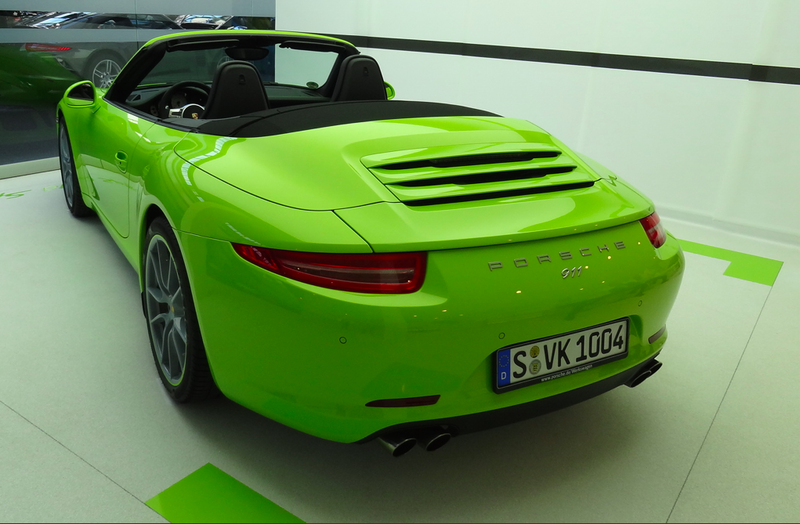 On the 991/981, we need to inquire as to where that color ID is found on the chassis! 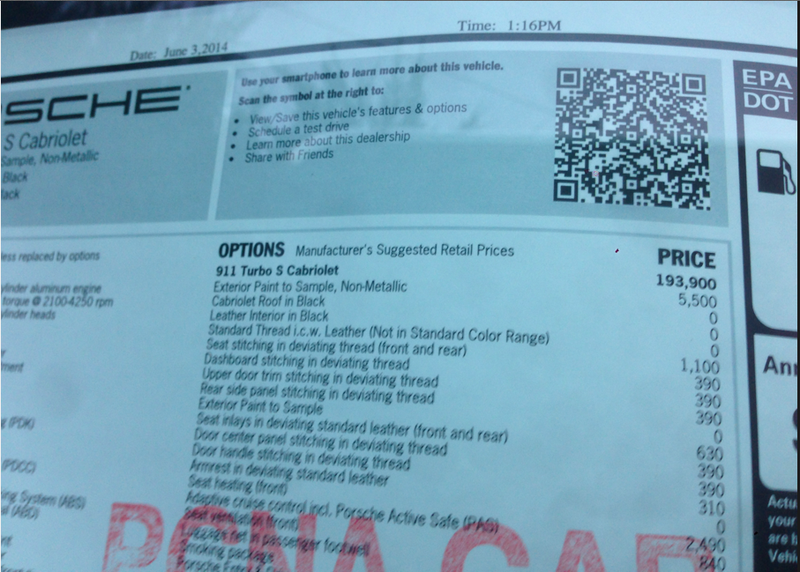 In addition, the Porsche dealer who ordered the car has access via PCNA's computer & order system the information sheet that would immediately give anyone the color code for that particular PTS in dealer inventory. But that is a separate sheet that is not on the car. 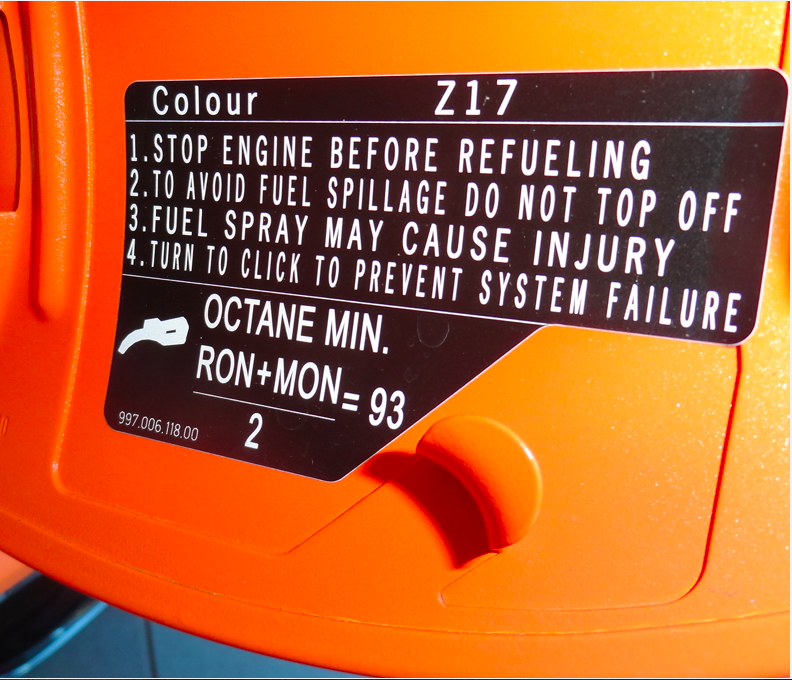 Re: gas lid: Can someone confirm if that this 'colour' code is still found on the inside of the gas lids of the newer PTS 991/981? If you have a PTS 991/981, I would appreciate if you could check that out for us! Thanks. If not found there, have your found the paint ID of your PTS 991 or 981 anywhere else on the chassis? Thanks for the updated PTS list. I didn't see Acidgreen on the newest list. Did I miss it? Are they still considering approving that color? I heard from my dealer that there has been a 918 order in that color. No, it's not on the latest July 2014 list. But it was on the 1/23/2014 list. It stated then that a feasibility test was needed (see photo #1). 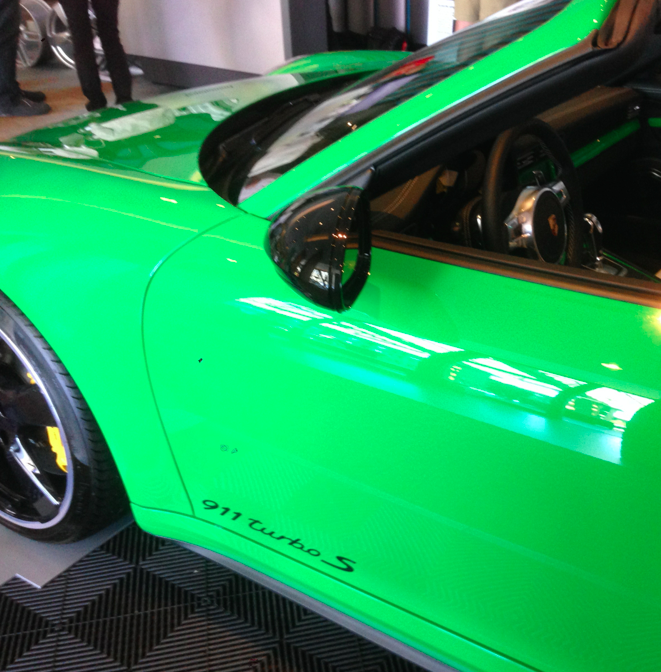 I was told by Melissa Witek last November at The Thermal 918 test drive that indeed a 918 customer had requested 'Acid Green' as a PTS color for his 918. Remember that the PTS list we are talking about only covers 991/981/Panamera. If the color is approved for the 918, we still would not see it on this list. At Sonoma Raceway two weeks ago, Melissa told me that 'Acid Green' was not yet approved...but that 'Lichtgrün' (historically called in English 'Birch Green') was almost an identical color! And that hue is approved for the 991/981 (last four photos). 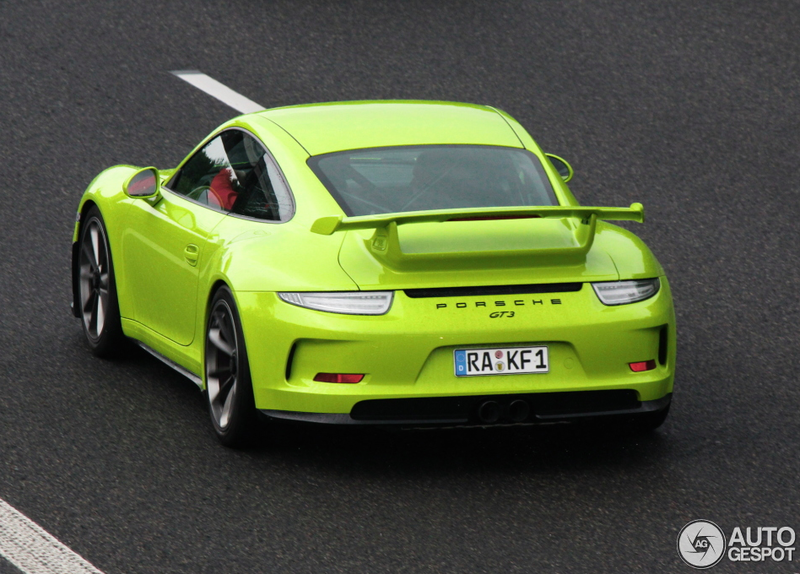 It's hard to tell on some of the pics of Lichtgrun - some make it look almost just like Acidgreen and some don't. Glad to hear that Melissa says it's almost identical. I'm trying to get PTS on my GT3 and Lichtgrun is what I'm leaning towards, unless Acidgreen becomes available. Your knowledge is always helpful, thanks again. 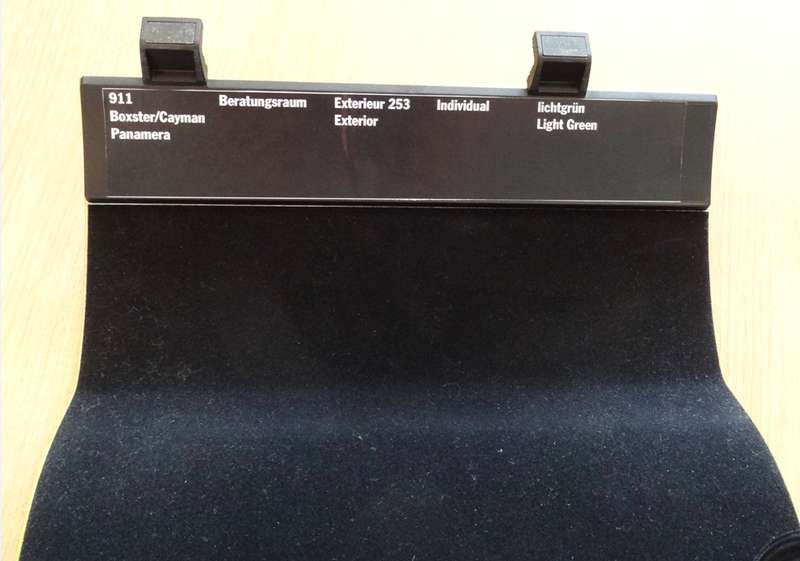 The photos that I took at the factory of the 'Lichtgrün' cabriolet are not particularly faithful to the color in daylight. 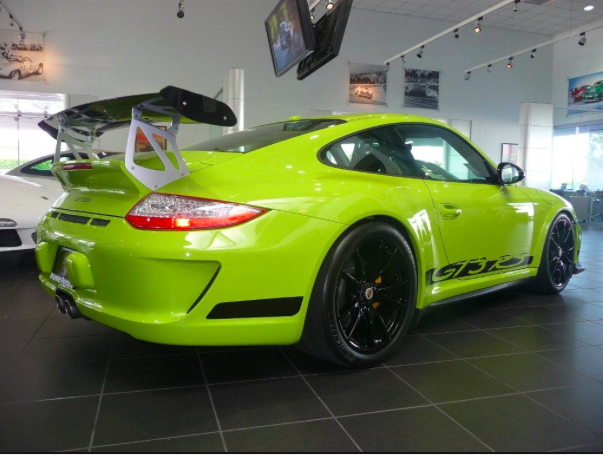 See these other photos (first 3) of the .2 997 gt3 RS that was ordered & sold by Pioneer/Porsche of San Diego a few years ago. That is really what 'Lichtgrün' looks like! 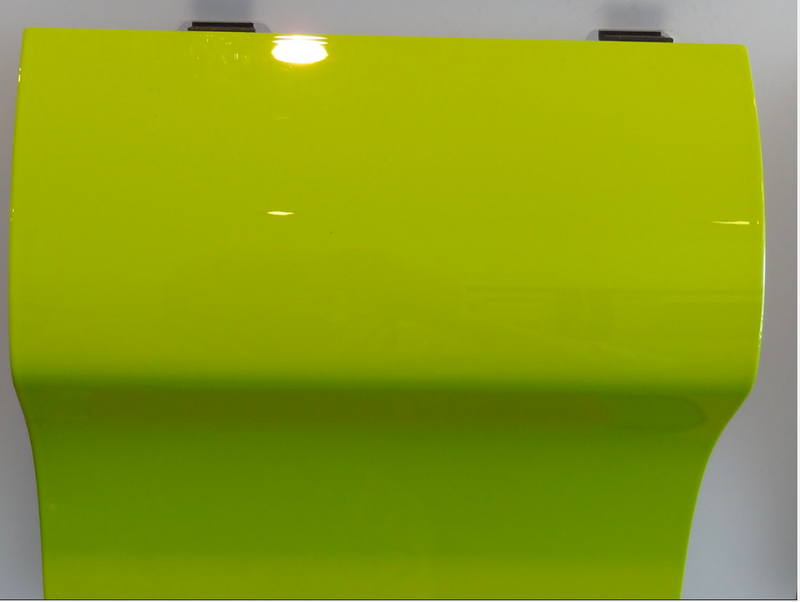 I have also heard that a gt3 customer is looking into ordering 'Chartreuse' or 'Lime Green', also an equally historic early 911 color. 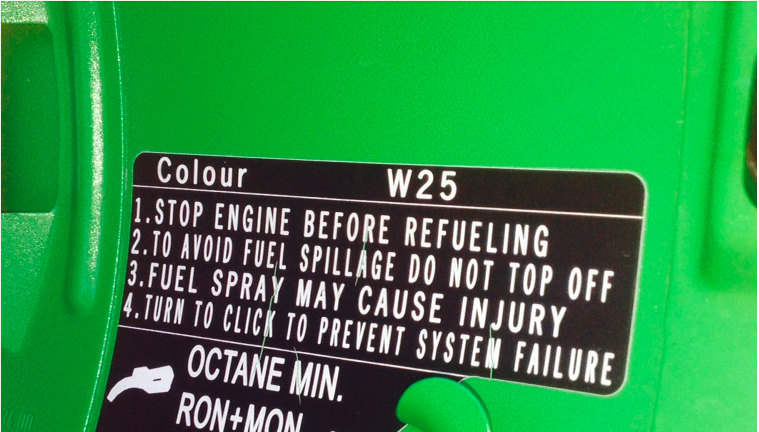 The color code is 226. That has yet to be tested, but hopefully that will happen soon! That color is a bit similar to 'Lichtgrün'...yet very different (see last three photos). It's never been a better time to order PTS from Porsche. The color selection available to us customers is getting better with each updated PTS list! Exterior Rear View Mirrors painted in deviated color! Thanks for the additional pics. 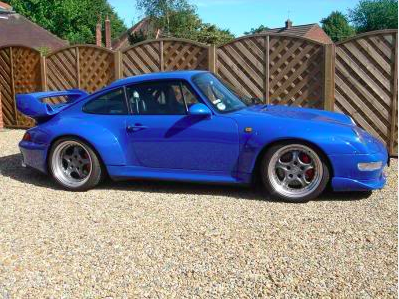 I love the look of that .2 997 RS, especially with the black wheels, mirrors, and spoiler. I had a white Cayman R with the black wheels, etc. I always loved that contrast. What is the likelihood of getting the mirrors and spoiler (or at least the end caps on the spoiler) black on the 991 GT3? I've seen the pics of the silver one with red wheels, etc. floating around. The likelihood is pretty good if CXX options are allowed to be continued. 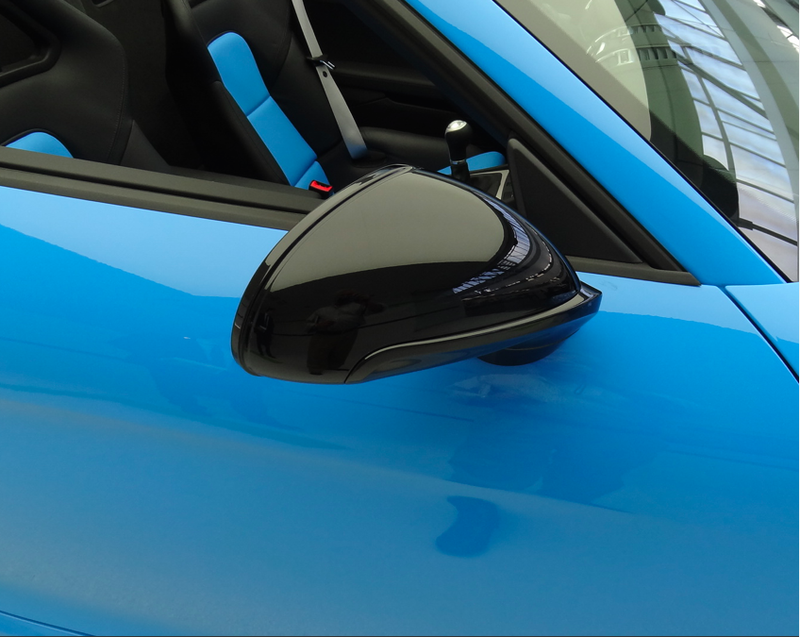 The exterior rear view mirrors in 'Gloss Black' - Yes! 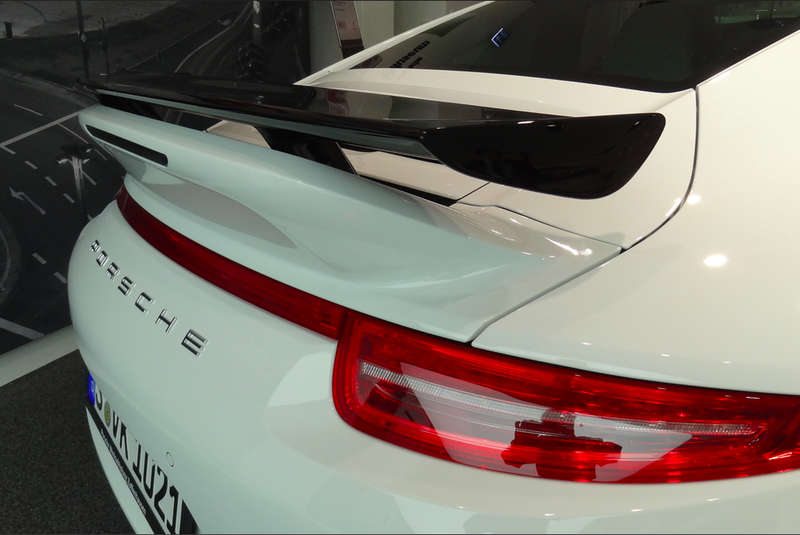 Fixed-wing profile on Aerokit Cup, rear spoiler of Boxster/Cayman and hood...all painted gloss 'Black'? Sure. And the end caps of spoiler on gt3? Probably! CXX is their 'special request' option that you will never find in the configurator. It will not be inexpensive, though! Currently (as of late June, 2014), CXX was on 'hold' but they are hopeful that PAG will allow it to be ordered soon! Another Rennlist forum member has posed that same question recently to Melissa Witek and she will get an answer back from Germany soon! Hopefully this Rennlister will let us all know re: her response. PS All photos (except #3) taken by me of actual 991's/981's with trim done in deviated color - 'Black' - by the factory via CXX! Last edited by Z356; 07-14-2014 at 03:34 AM. Why do some colors like 'Guards Red' & 'Carrara White Metallic' show up on PTS List? On the PTS lists Guards Red shows as ? ? ? Similar issue raised by 'apias' at 991 forum & requires same answer. 'Guards Red' is not offered on Panamera. But a Panamera customers orders it. Thus color is tested & approved for Panamera. That is why it's on the PTS list. But I agree that technically the ? on the 991/981 column should be instead a NOT AVAILABLE (zero with dash) since that color is not available for that model as a PTS. Or instead, create a new status - 'NOT APPLICABLE'. Kind of weird that Yachting Blue Metallic is listed as "feasibility check necessary" for the Panamera when it's already an available color for the Panamera. PTS in that color ('Yachting Blue Metallic') is not available for the Panamera because it's an available $790 option on that model as you stated. It got put on the list because a 991 or 981 customer ordered it, then got tested and approved for just those two other models! Just like 'Carrara White Metallic' is not available as a PTS for the 991 & 981 because it's currently an available option at $710 for those models. But it was petitioned by a Panamera customer, got tested & approved for that model...and that is how it got to that list! But I agree that technically the ? on the Panamera column should be instead 'NOT AVAILABLE' (zero with dash) as a PTS. Or 'NOT APPLICABLE". That would make the logic consistent with how 'Carrara White Metallic' is handled by the PTS list. Thank you so much for your efforts Eduardo, they are a huge help to the community and especially us unique color lovers. I have a whole folder on my desktop dedicated to your Paint-to-Sample PDF files! I have one question regarding the "PTS window." I am hoping to do a PTS and European delivery some time in summer or fall of 2015 (on a GT something) and have been unable to get a solid idea on when the PTS window is open vs closed. Is there a pattern or calender that shows when the widow will be open in the future? I would like to do whatever it takes to make sure I can get PTS on my order! Would getting an appointment at the Beverly Hills customization center with Matthew Henry be the best way to obtain this far future information? Aerowerke: Thank you for your kind note. The PTS window usually opens at the start of the model year (when order books open*) and normally closes by late fall or early winter. I believe the PTS window for the MY2014 'shut' in late December of 2013. And it would not surprise me if the PTS window for MY2015 is closed at about the same date in 2014. Since you are planning both PTS and European Delivery, I would think you need to be extra careful with your ordering --- because next year will likely be when Porsche introduces the .2 991 facelift! So if you want a MY2015, you can order one for PTS and ED in the next five months. And that order for your MY2015 will be available for Euro Delivery probably in the Spring of 2015. Certainly before MY2016 991 production starts, which may be May or June of 2015. So that means you doing ED with your PTS MY2015 991 in late Spring/early Summer of 2015! If you want a MY2016 991 to take advantage of the facelift, you'll have to wait until they open the order book. That will not happen anytime before Spring of 2015. And we don't know how PTS or European Delivery will be handled for that model just yet! You might be able to get a Fall 2015 Euro delivery on a MY2016....but perhaps not PTS! PTS is handled differently by the factory and usually done in batches...with plenty of delays to coordinate with all the just-in-time vendors so that the PTS pieces are done correctly & match the color! If you want both Euro Delivery & PTS on a MY2016 991, you might have to wait until Spring 2016 for that combo to be delivered to you! It might be worth it. I would be to me! But that is just my analysis from observing the recent past history of PTS at PAG. I don't think anyone at 'Porsche Exclusive' will be able to tell you much more than this. In fact, I am pretty sure they'll tell you 'LESS'. They can NOT talk about the 991 MY2016 or the 'possible' facelift. *Order Book for MY2015 991 & 981 started earlier this Spring, although actual production didn't commence until first week of June of 2015! 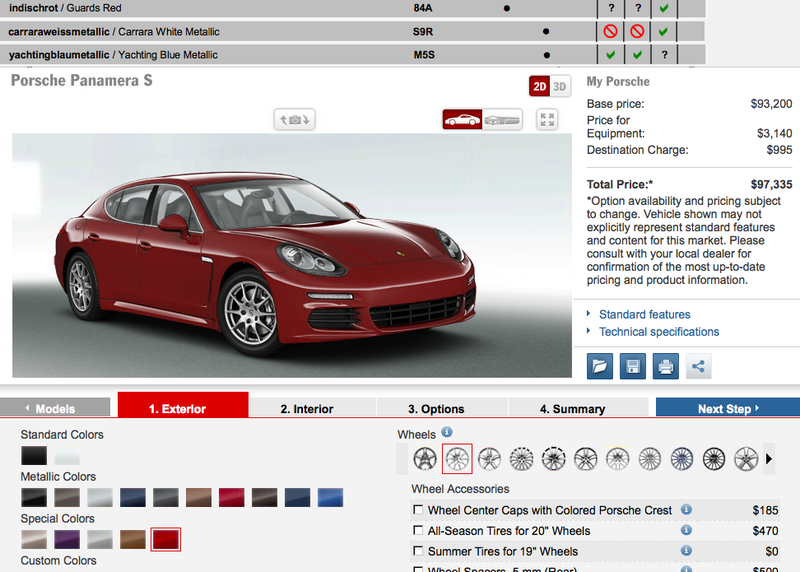 It coincided with when the Configurator made the changes for MY2015 - new colors, new options, etc. 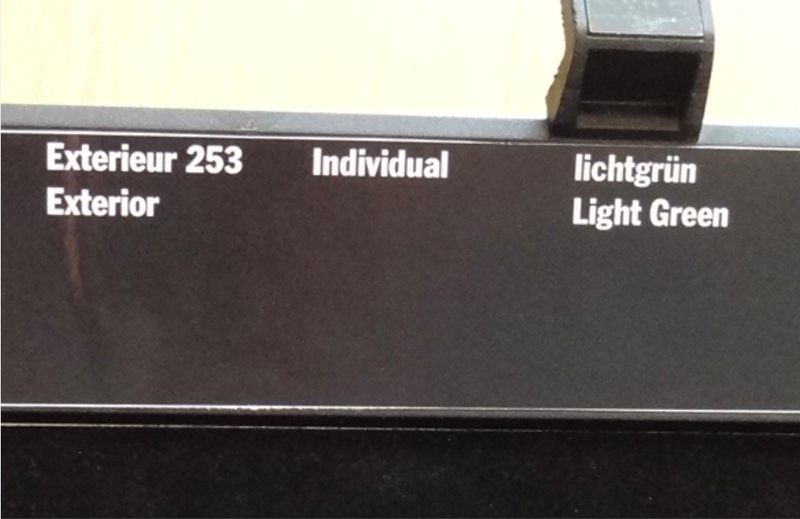 'Birch Green' is indeed 'Lichtgrün'! 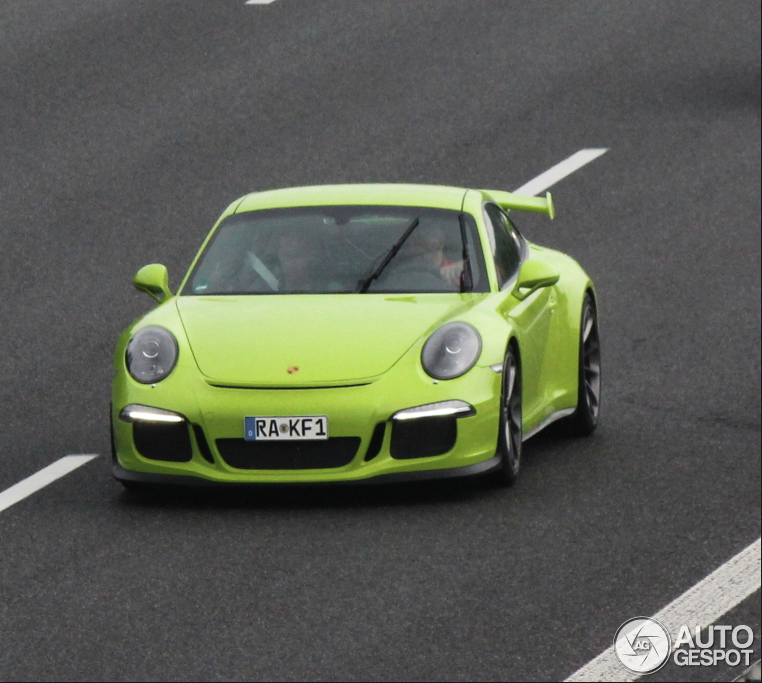 I don't know what color lichtgrun is but I was under the impression that the GT3RS in the first 3 photos is birch green? 'Birch Green' and 'Lichtgrün' are one and the same. It is a 1974/1975 historical early 911 color that could be special order from the factory at that time! Today's PTS 'Lichtgrün' has the same color code (253) as the old 1974/1975 'Birch Green/Lichtgrün', so that is very significant & tells you it's the same color too! 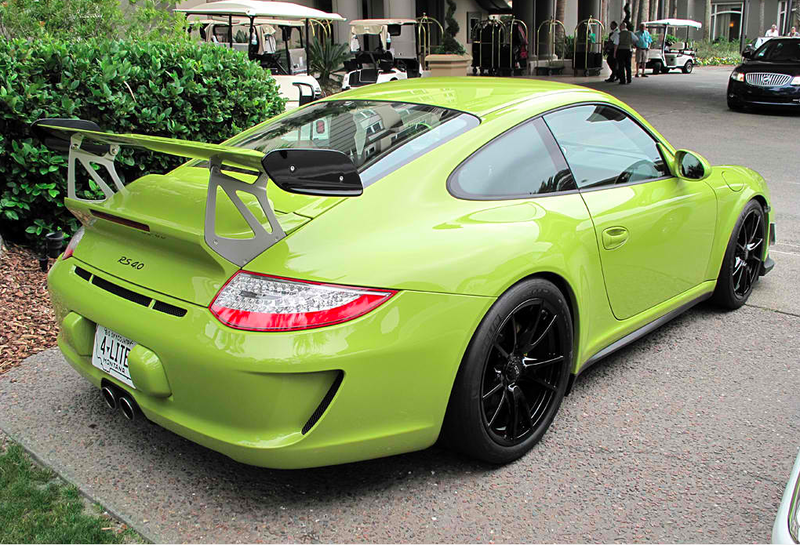 PAG, however, made the mistake to give it a new English name when they approved this color for PTS in the late 997 period! 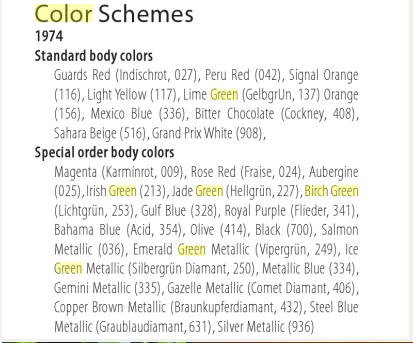 So they translated Lichtgrün as 'Light Green' and forgot that historically the English name for this color was 'Birch Green'. 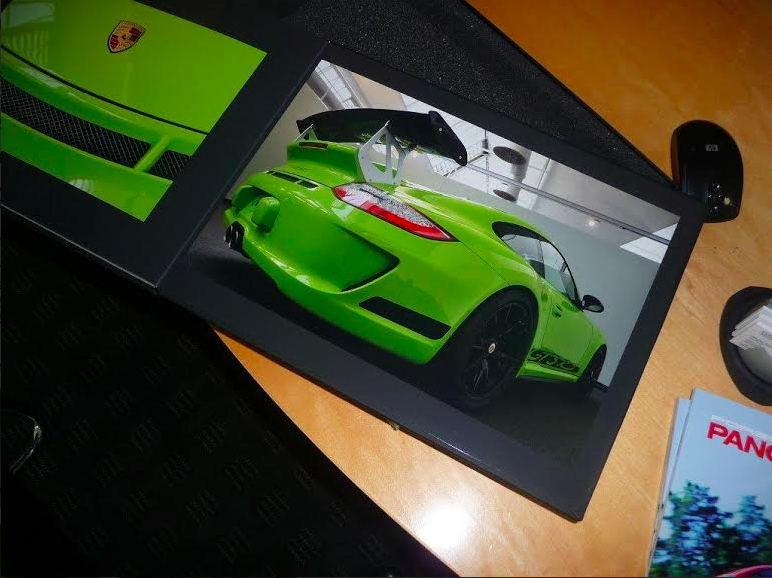 See the attached sample color piece from 'Porsche Exclusive' at Zuffenhausen which I tool last year (photos #1 & #2)! 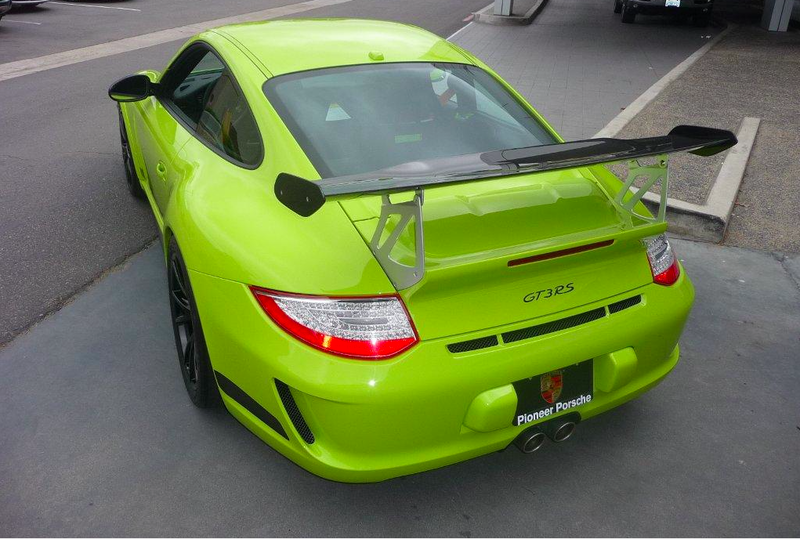 Yes that gt3 RS was indeed 'Birch Green/Lichtgrün' and custom ordered by the fine folks at Pioneer/Porsche of San Diego. 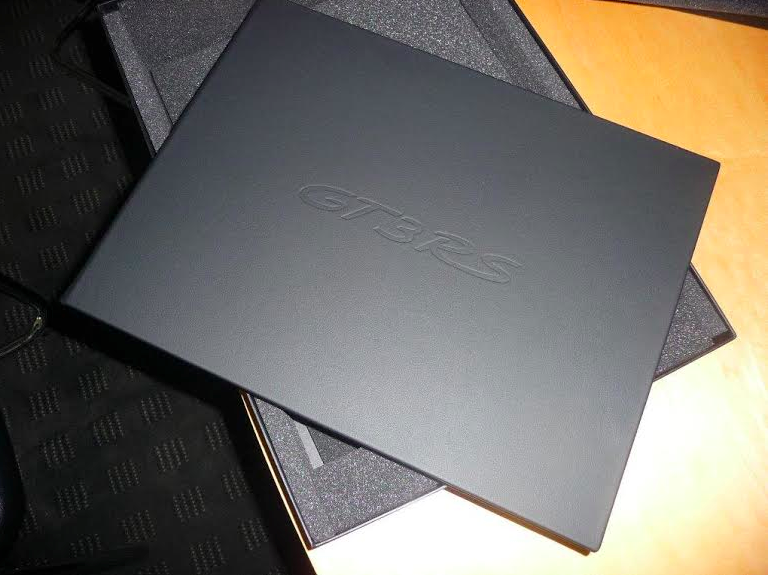 It arrived late March/early April of 2011. 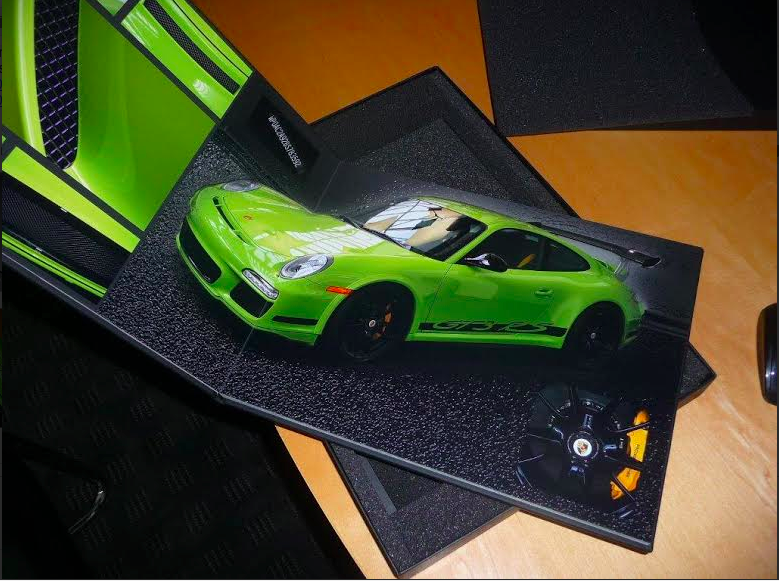 It came with a beautiful book with its production progress that is an option at 'Porsche Exclusive' whenever you order a PTS Porsche (see photo #4 & #5). I should talk more about that in my 'Custom Ordering' thread. Thanks for reminding me of it. What's the process for ordering the "book", Eduardo? I have heard about this but never seen one. The rumor is it's quite expensive - $2500 or so? I would still consider it, at least to the point of getting a firm price. Dealer expects my allocation to open up this week or next and freeze relatively quickly. 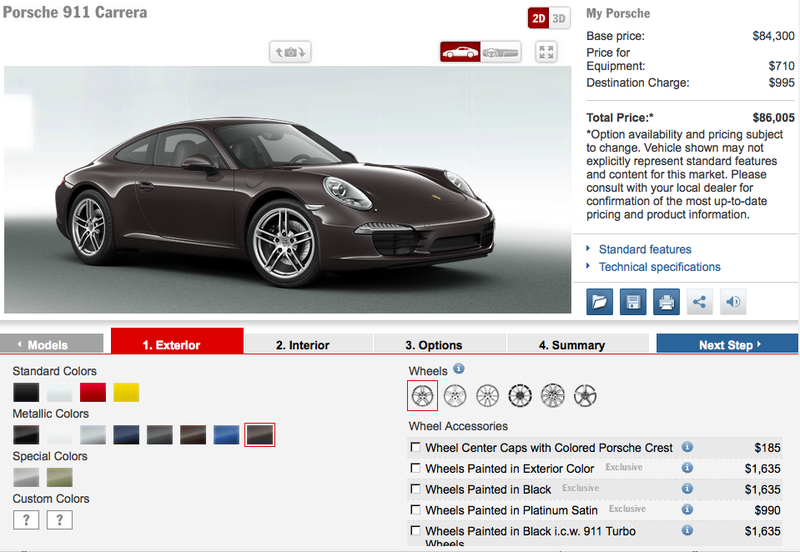 The 'book' is an option provided by 'Porsche Exclusive'. 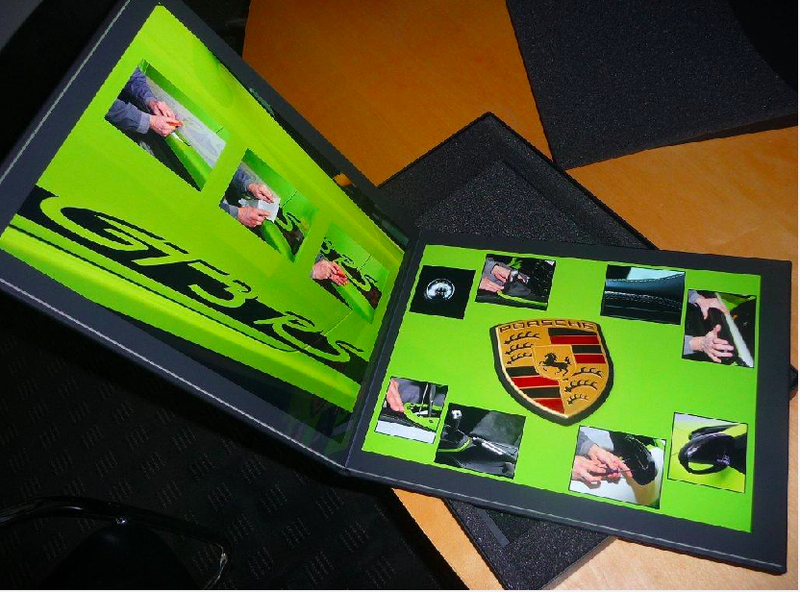 They take photos of your specific car while still in production at Zuffenhausen and make a hard-bound 'memento' of it for your coffee table! It's not listed on the configurator. But in the past it definitively has been available to those who are in the know, request it and are willing to pay for it! I don't remember exactly the cost of this option, but it was expensive! Over €1K if I recall correctly. It was quoted to me when I saw one for the first time in person last year at the factory in Zuffenhausen. It was a copy of one ordered by a client for his PTS vehicle. 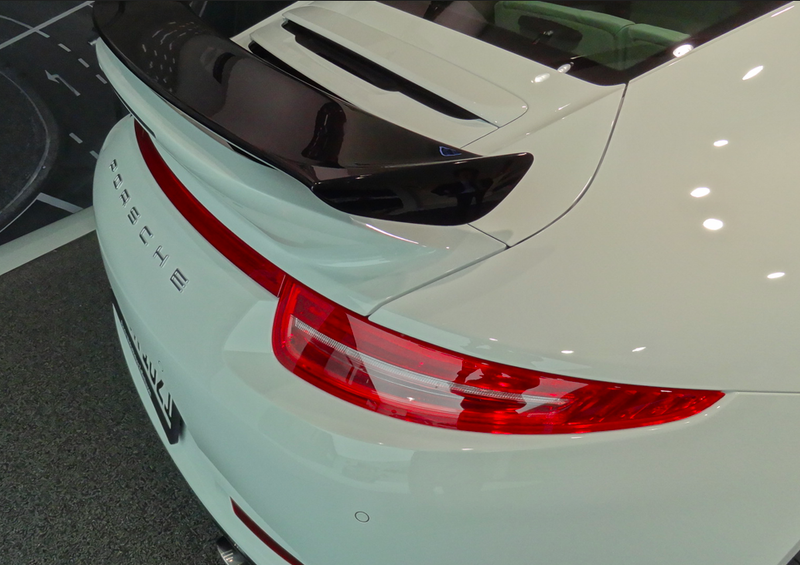 And it was on display in the special work room where post-production customization of select 'Porsche Exclusive' options are installed in cars that are coming out of the general assembly line! This work room is located right behind the normal 'factory delivery day' pick-up room on the second floor. This is the building which has an entrance on Porschestraße in Zuffenhausen and its often refer to as the 'Driver's Selection Shop' at Porsche! 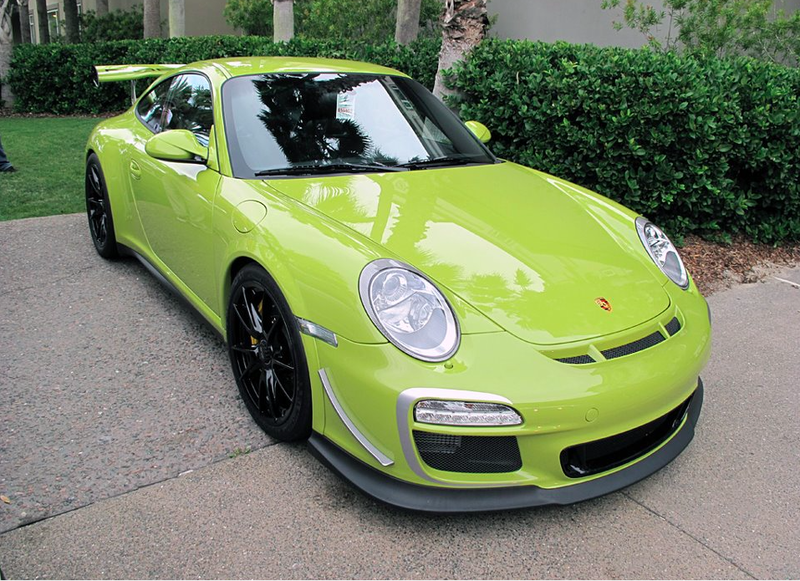 The only US vehicle I have ever seen one ordered with was the 'Lichtgrün /Birch Green' .2 997 gt3 RS ordered by Porsche of San Diego in 2011! 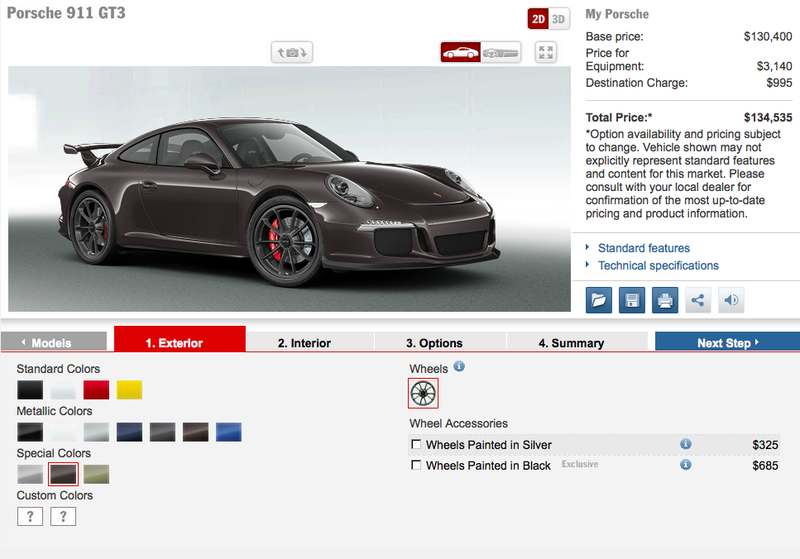 Keith I suggest you or your dealer contact 'Porsche Exclusive' in the US or Germany to find out the exact cost of this option for you upcoming PTS vehicle order! 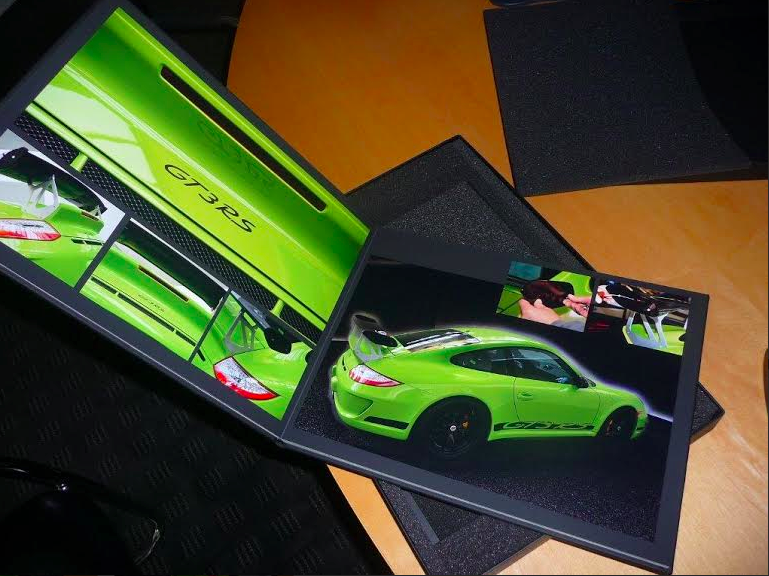 Or you can contact Matthew Bang at Porsche of San Diego and see if he remembers the exact price of that book on their old 'Lichtgrün /Birch Green' .2 997 gt3 RS! 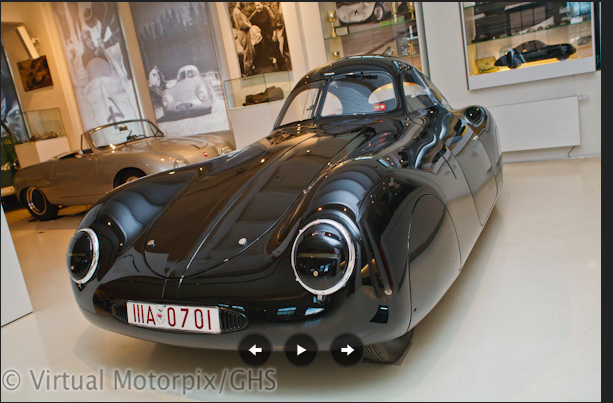 Hamburg's Automuseum Prototyp, plus the haunting song 'One hundred Porsches and Me'! I have just come across information on a relative new museum in Germany while researching for a post I wrote re: the Type 64 on the 991 gt3 forum. 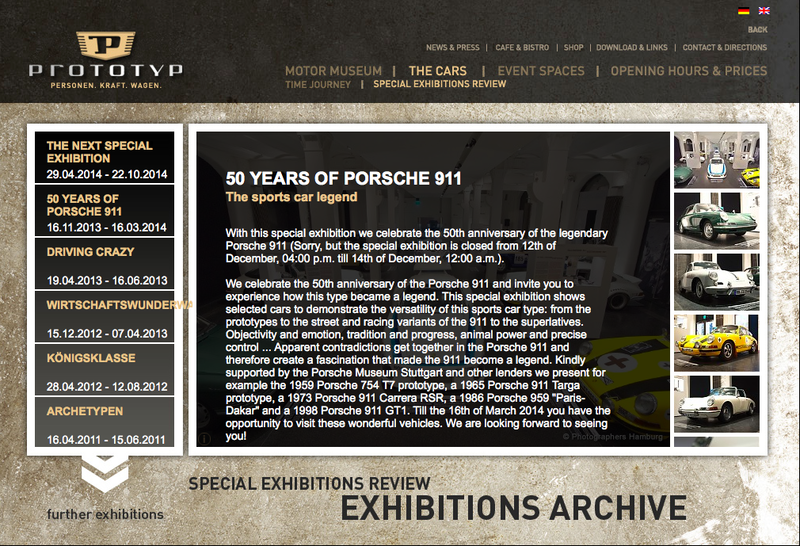 But the museum has intrigued me so much that I am posting about it at all my PTS/'Porsche Exclusive' threads so that it gets wider publicity! Yes, another story. And a fascinating one at that. Porsche 64, Type 64 and Type 60K10. Berlin-Rome Race cars. Three built in aluminum by Reutter. 1939. One remained in the hands of Austrian Otto Mathé. By the way, one of the most interesting auto museums in Germany, Hamburg's Automuseum Prototyp, has this interesting displays of not one, but two, type 64's! "Certainly one of the most significant items on display is the Porsche Type 64, the forerunner of the VW Beetle (or KdF-Wagen) and the Porsche 356 cars. This very important vehicle, one of only three fabricated for the 1939 Berlin-Rome race, is the only survivor in its original form. Of course the race never did take place due to the war, and the three cars were stored in separate locations, one being stored at the Gmünd factory in Austria, the second one at the Porsche family’s home at Zell-am-See while the third was totally destroyed. The ‘black’ Type 64 was requisitioned by the American forces after the war and they proceeded to cut the roof off, and quite literally thrashed it into the ground. When the Americans left, the second 64 was broken down and the remains were kept until Otto Mathé bought the green car T.2222 (photo 1 & 2) and the parts belonging to the second car, which had by now lost its body. 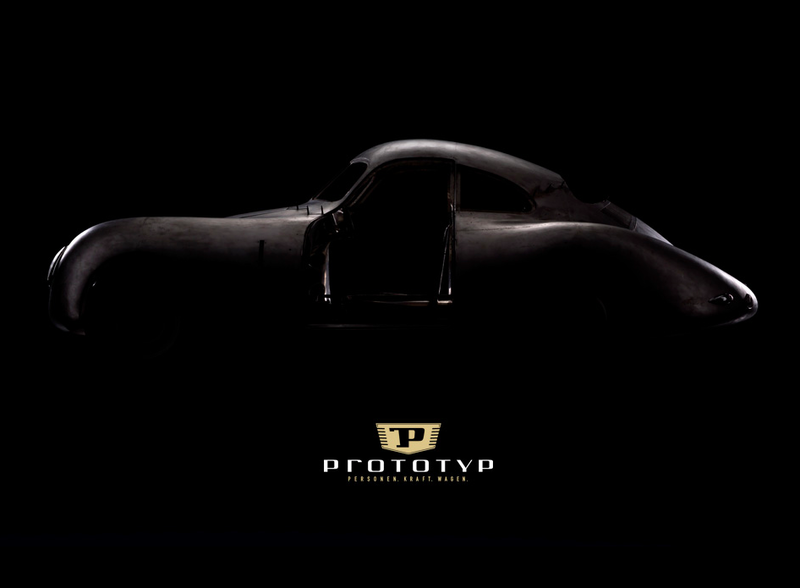 Over time the Automuseum Prototyp has had this car rebuilt using the original parts, and as a result, the car is almost completely original apart from the body, which is new (photo 3). 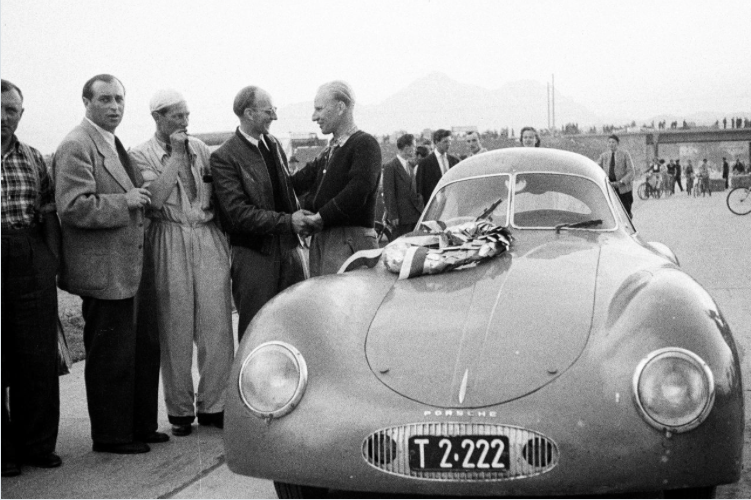 The importance of the Type 64 cannot be over emphasised as many cars, including Porsche’s own 356 and various race cars, borrowed design cues from this car." They recently celebrated one of our favorite models with a special exhibition entitled: '50 Years of Porsche 911' (photo 5). Once you hear the haunting music at the link, you'll be hooked: 'One hundred Porsches and me; wanting to be different, wanting to be free...One hundred Porsches, this is the way it's supposed to be!'. 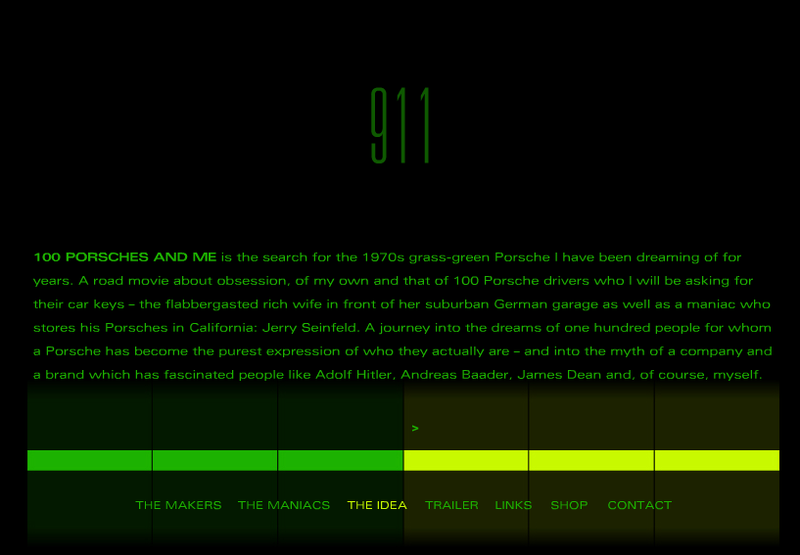 The music comes from an obscure documentary filmed in 2008 by André Schäfer about his search for a 1970's era 'grass green' special color Porsche 911 (photo 6)...a story dear to our hearts here at PTS Zentrum! Don't leave Germany on your next trip without paying a visit to this museum. I certainly will not miss it! seems like the approval process makes it more like " extra charge colors " rather than " paint to sample ". No, take a closer look at the list: 'Glasurit Colour SB272.20', 'pantone 296C', etc. It can match the gloss lipstick of your wife...if you wanted it to! Just send Porsche a sample of that lipstick's color painted on a piece of metal, plus an order for an expensive Porsche model (e.g. 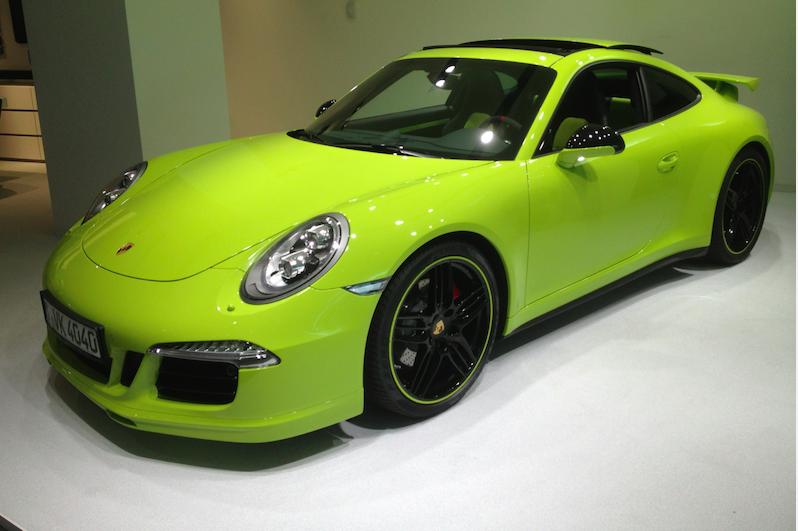 991, 981) which includes the $5,500 option! Then just sit back and hope its approved! Voila. It's truly 'Paint-to-Sample'...if you have the 'cojones' to take it there! 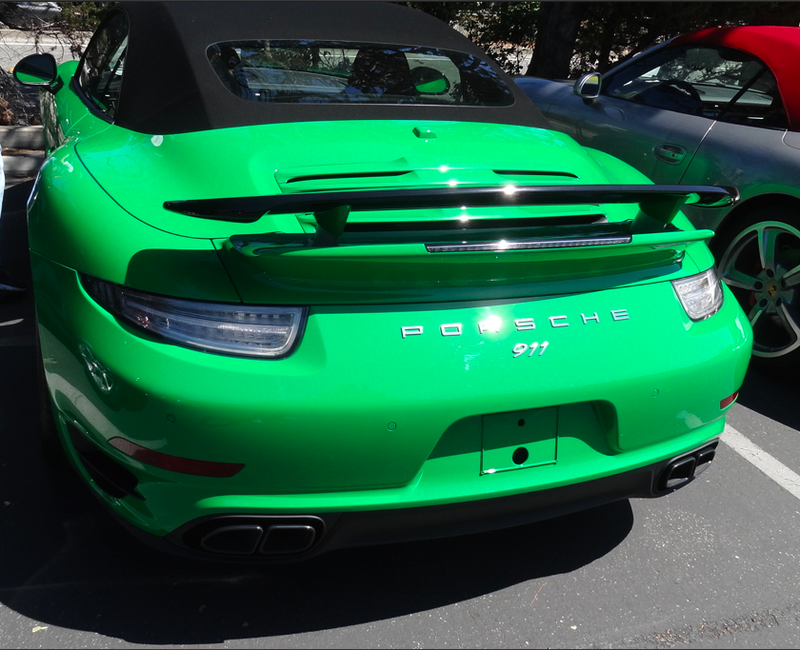 However, most of us are satisfied with getting a vintage, heritage color from Porsche's past, like the elegant 'ModeGrau' or the captivating 'Viper Green', to make our 991/981 feel pretty unique & bespoke! But it took someone with a vision & a desire...plus an actual custom order...to get each & everyone of these 'colors' on the approved PTS list! That is how this PTS list has been put together...and that is how this PTS list is growing in possibilities with each passing month! Your point referencing introducing another colour for roof material is a well thought out critique...I think I have more than enough more realistic options without venturing into the unknown realms of a special Targa top covering (I would agree!). Thanks for your input on that issue. Melissa (NY) has been prompt, super knowledgeable, & most polite. She provided many printed pages so I can work through all the custom touches & interior mods; understanding exactly what the associated codes mean. She’s also been a great help tutoring what’s realistic, possible, & not bankruptcy inducing. Almost every one of your suggestions of detail touches & interior appointments (with associated picture references) is simply invaluable. I know it took considerable time to put together such a comprehensive reply. Kudos & many many thanks. As I make additional progress locking an order slot I'll keep posting some undoubtedly 'simplistic & stupid' questions; but perhaps others can learn from my neophyte mistakes. Hopefully our paths might cross sometime in Stuttgart or at a Porsche ‘event’. It would be my distinct pleasure to buy you a local stein or glass of German chardonnay. Cheers & thanks again sir! Thank you Marko for your kind words. I would also like to make this personal statement on the current re-structuring of 'Porsche Exclusive' in the United States. This message is directed at all of you, who like Marko above, have received assistance from Melissa Witek of 'Porsche Exclusive' during your own custom ordering process in years past! As we speak, Melissa is auditioning for the job as Manager of 'Porsche Exclusive' for North America! The previous manager Sascha Glaeser, who was brought in for that job from Zuffenhausen, is taking a new position with 'Porsche Experience Centers' which are planned for LA & Atlanta! There are several others PAG employees from Germany that are vying for Sascha's old 'Porsche Exclusive' post here in America and are actively competing with Melissa for this important manager's job. But I think it's fitting to have one of our 'own', a person that understands our particular market's thinking & needs, in this key position at PCNA! That is why I believe that Melissa Witek deserves the job and our support at this crucial juncture. As much as I value my German friends at PAG, I do think we need an American perspective at 'Porsche Exclusive' in the US! And I believe that Melissa Witek, as manager of 'Porsche Exclusive' in the US, will be able to carry that 'battle flag' for us in interactions with 'Porsche Exclusive' in Germany! And this is exactly what will be needed IF we are ever to have a more effective 'PTS' & 'Porsche Exclusive' option program that meets the specific needs of OUR distinctive North American market! So to represent us effectively, I believe we need someone who is an American & that has not been brought up in the static European business model (e.g. PAG) with its restrictive 'Top-Down' corporate mind-set! So, if at all possible, I urge you to please put in a good word & message of support for Melissa with PCNA (if you have any contacts there) or via your Porsche dealer's GM or Dealer Principal. The ultimate goal is to get that message delivered directly to Detlev von Platen, CEO of PCNA & the person that will ultimately decide who is the next manager of 'Porsche Exclusive' in the United States! Melissa has not asked me for this help...but I think it would be a nice gesture of those of you that she has helped in the past with your customization details to offer support for her now! Thank you! Last edited by Z356; 07-19-2014 at 06:09 PM.